He’s gotta go fast! Be as fast as Sonic and pre-order your TOTAKU™ Sonic today. First introduced in 1991, Sonic the Hedgehog has remained an iconic character well-known for being SEGA’s mascot. He is famous for his ability to run faster than lightning with quick reflexes to match and help attack his enemies. 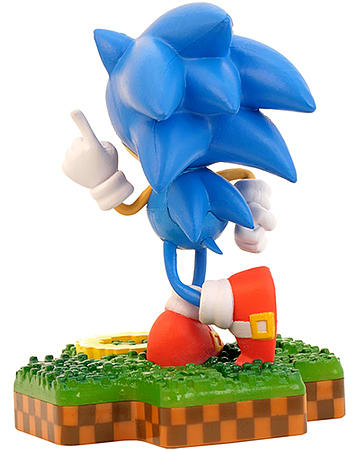 Sonic is an incredible gaming hero and this Sonic figurine is perfect for any fans. Did you play the games released on the first-generation consoles or do you enjoy the newest games in the Sonic series including Team Sonic Racing and Sonic Mania? This figurine is perfect for all. He’s fast, he’s brave, and he’s a gaming legend! Pre-order the TOTAKU™ Sonic today. Known for being able to run as fast as lightning with reflexes to match, Sonic the Hedgehog has been a legendary gaming character since SEGA first introduced him in 1991. Ever since he has been SEGA’s mascot and is also considered a gaming legend! Since stepping into the battles and attacking enemies, he has been the champion of peace. Sonic has travelled far and wide, teamed up with other recognisable characters such as Mario, and shown his love for freedom and adventure. From the first games to the most recent Team Sonic Racing and Sonic Mania, his cocky and determined behaviour makes him a loveable character. The TOTAKU™ figures are 10cm tall and highly detailed with multiple ways to display each character. The figures are numbered so you can either collect all the greatest gaming heroes or purchase your favourite. The unique cross-shaped base offers a sturdy and durable fixed base. Pre-order your Sonic figurine today!